All too often in mainstream American cinema, the central focus of coming-of-age films revolves around the first sexual experience of our teenage leads, whether it's through Pie or around Ridgemont High. To quote Limp Bizkit front man Fred Durst, for teen movies, Hollywood does "it all for the nookie” of flesh that translates to dollars. Meanwhile, indie and foreign filmmakers open our eyes to unexamined aspects of our incredibly complicated world as viewed through the eyes of youths coming-of-age in creations that are richer in content than Pie. But luckily for us, the prestigious first run DVD of the month club Film Movement has consistently excelled in delivering some unforgettable works about children and teens who find their lives changed within an instant. 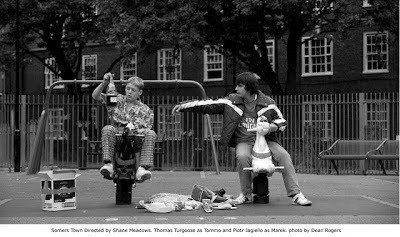 This highly recommended black and white production from filmmaker Shane Meadows is no exception when it comes to the genre. The Edinburgh and Tribeca Film Festival award-winning Somers Town is as inventive, curious and energetic as its two young stars Thomas Turgoose and Piotr Jagiello. 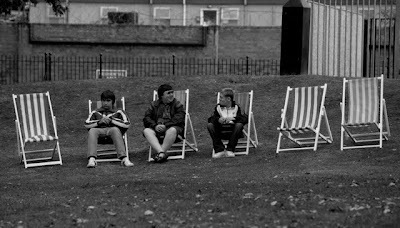 The young men collaborated with Meadows in an extensive rehearsal period to create the film before cameras even began rolling on their story of newcomers to London's immigrant working class district. The movie was originally conceived by screenwriter Paul Fraser as a short film that reflected “the regeneration of the area of Kings Cross and St. Pancras in central London” along with “the relocation of the Eurostar International terminus to the newly renovated St. Pancras station on the edge of Somers Town.” However, fortunately, when Meadows came aboard the figurative train in a film funded by Eurostar, the short evolved into a mesmerizing feature-length motion picture. Opening with the train that also serves as a metaphor for the physical and emotional journeys of the characters, Turgoose's Nottingham runaway Tomo arrives in Somers Town. Although certain ideas are hinted at throughout the brisk 70 minute running time, we're never quite sure just what the back-story is surrounding Tomo. 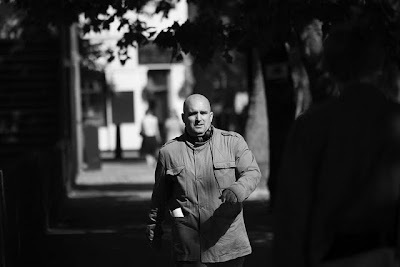 This avoidance to include a cliched scene for the sake of exposition signifies great confidence and competence by Meadows in his scene-stealing star, with whom he'd previously worked in the critically acclaimed hit This is England. Having earned an award at the Tribeca Film Festival for his performance in this film that was shared with his co-star, Turgoose's deft portrayal of the quick witted Tomo is something marvelous to witness. Perhaps best described as a docudrama, which is enhanced by the meticulous attention to detail of filming most scenes in a single continuous take with two cameras for coverage, Meadows' 16mm work is given a gorge0us transfer from Film Movement. The newly released DVD makes Turgoose's talent even more apparent in the way that he can evoke Dickensian pathos of scheming innocence as well as recalling a younger version of James Caan's Sonny Corleone in The Godfather thanks to his knack for charming and impulsive manipulation in a single scene. Enviably secure in his own skin for an adolescent, after befriending a woman on the train and engaging adults and children alike, Tomo finds himself outnumbered when his bag is stolen and he's beaten by a group of kids that cruelly teach him that he can't fast-talk his way out of everything. Obviously realizing that he can't live on the streets, he soon becomes the best mate of the shy and sensitive Polish immigrant Marek (a subtle turn by veteran actor Jagiello), to whom Meadows endeared us earlier on in the movie. Still grasping the English language and picking up profanity faster than the rest of England's strange new vocabulary, Marek meets Tomo while spending a dull summer alone, in which most of his time is dedicated to snapping photos of the beautiful French waitress Maria while his father builds the train station. Although their personalities are polar opposite from one another, they recognize the outsider in each other and bond by sheer social need and of course, the luck of proximity as Marek agrees to give shelter to Tomo as long as he stays out of his father's sight. And what begins as a slightly tense bullying dynamic as we fear that Tomo is going to take advantage of the sweet Marek grows into a London teenage take on Tom McCarthy's American indie sleeper The Station Agent. 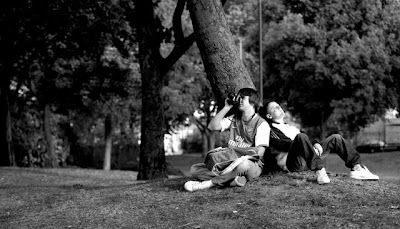 While Somers Town shares Agent's dynamic of not just two males and one female, in the hands of Meadows, their relationship evokes a sweet love triangle reminiscent of Truffaut films of the '60s as both boys fall under the spell of a third immigrant outsider in the lovely French waitress, Maria. As the movie continues, Somers Town breaks free from its black and white naturalistic lensing by culminating in a beautiful full color, tender home movie style segment. Since it is a coming-of-age story, this brave decision to switch up the visuals easily risks closed-minded accusations of nostalgic sentimentality. Yet, Meadows knows that it works and he bravely includes the emotionally satisfying sequence that not only fits the evolution of the tale but also manages to surprise us at the same time. Once again, Meadows put his own unique spin on the popular European hybrid of blending together John Cassavetes style improvisation and the Cassavetes gritty minimalist influence of WWII era Italian Neorealism with a celebration of dreaming youths from the French New Wave. And the result of the filmmaker and his talented cast and crew's effort is a work that's earnest, sweet, genuinely funny and more importantly truly human in its depiction of youths coming-of-age. Impressive enough to make me want to see Meadows' other titles and among the best Film Movement releases of the year, Somers Town will hopefully make you want to put down the Pie and take a train past Ridgemont High to the Town that once boasted Charles Dickens as a resident for a film I truly believe he would've enjoyed. 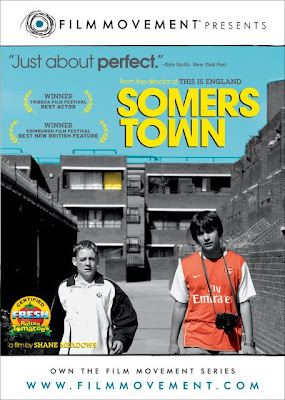 FTC Disclosure: Per standard critical practice, Film Movement provided me with a screener review copy of Somers Town, which had no impact on the honesty of my review.